The first up is an old favorite that’s finally been revisited- Artichoke Basielle Pizza & Brewery. There is nothing quite like getting an enormous gooey, cheesy, creamy, buttery, delicious slice of artichoke pizza. 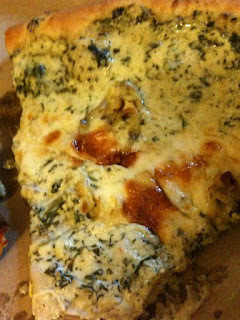 It’s like slathering a piece of crunchy dough with a big bowl of spinach artichoke dip. I mean really- look at those gorgeous brown cheese pockets among valleys of artichoke, garlic and balls of mozzarella. Although I love this pizza I can only handle half a slice at the most. My weak stomach can’t take all of the heavy rich topping, so when I reach my limit I turn to the Sicilian instead. Truly the closest thing to DiFara’s pizza I’ve ever had. 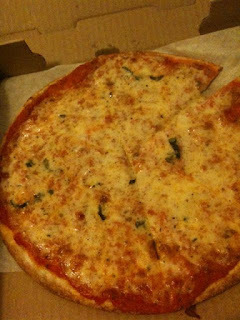 The crust is very crisp- almost a little too crisp sometimes but the toppings are spot on. Tangy tomato sauce, fresh basil leaves, a liberal drizzle of tasty olive oil and a dousing of grated Parmesan cheese, make this pizza just amazing. It is an utterly delicious delight. Also they just added big cups of Budweiser for only $5.50 a glass! Not exactly up to their brewery name yet but a score nonetheless. Now while I just talked about the thick, huge slices that are Artichoke pizza- let's talk about Vezzo. As you can see Vezzo is a horse of a different color compared to Artichoke. Their pizza is almost paper thin with a cracker like crust. See how you have to fold the pizza to even get it out of the box? Even though the crust is crispy the rest of the pizza is so thin it just sort of flops around…which is fine by me! 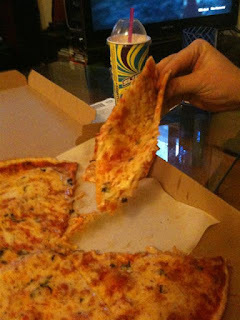 I love a thin, floppy pizza. The bottom always has a nice charred up skirt and the ingredients are extremely fresh. 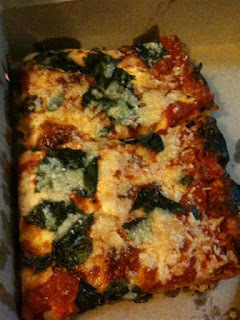 While I think Artichoke may be the best pizza in the city Vezzo certainly isn’t far behind. It’s just a different style. How lucky am I to be living right smack dab between these two places!